About the restaurant: Drawing its name from nearby Lake Borgne, this downtown establishment is a big, lively and lavish seafood house. It’s also the signature restaurant of Hyatt Regency New Orleans and, more important, the chef is Brian Landry, formerly of the legendary Galatoire’s. 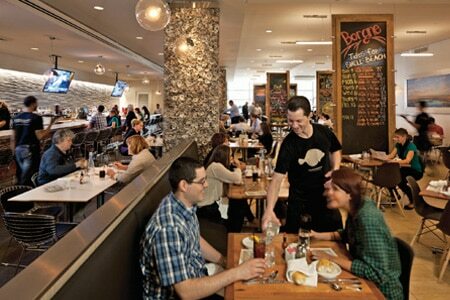 Food & Drinks: Landry showcases his talents at Borgne, by preparing innovative Louisiana seafood dishes. Whole flounder is stuffed with Louisiana crab and Gulf shrimp. Catfish is smothered in spicy tomato tasso gravy. Entrées are well-executed, but you might find yourself filling up on selections from the raw bar. Oysters are fresh and plentiful. Wines complement the cuisine, although there are a few varieties that may surprise. Desserts are a treat; we suggest the banana cake with brandy ice cream, salted caramel and walnuts. Daily happy hour is a see-and-be-seen experience, so expect crowds and a noisy atmosphere into the early dining hour.